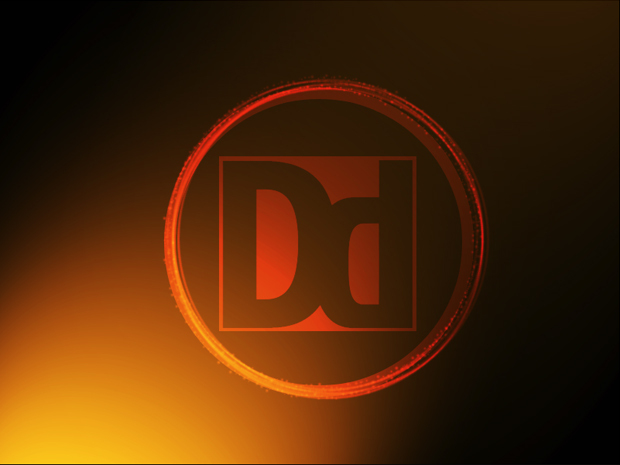 We are going to create an abstract scene with text or a logo, several circles and mixed with the magic of Photoshop. I saw something like this on the TNT TV network and I wanted to re-create it. I couldn’t find it online but it looked something like the image below. This tutorial will use several techniques to create this image, and hopefully some of it is new to you, or youâ€™ll at least find it interesting. Lets start by creating a new document in Photoshop. I am going to use 800×600 for mine. Now change the background to black. Now lets give some initial lighting effects. First we need to create a new layer (apple+shift+n), call it glow 1 and fill it with white. Now we are going to give the background a glow, so go into filters>render>lighting effects. Change your settings so it looks something like below. We are going to repeat step 2, except we are going to make the color more orangish and adjust the angle of the light. 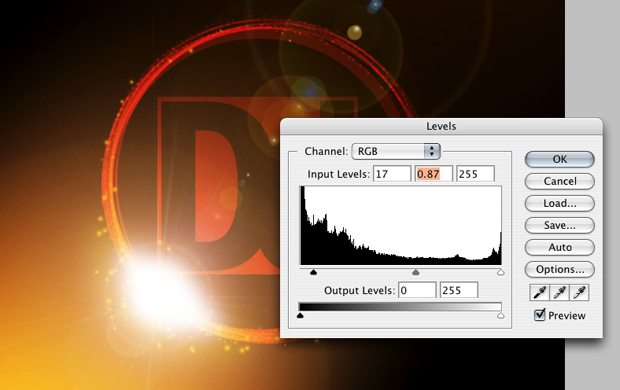 Copy the orange glow by clicking on the layer and pushing apple+j and change the layerâ€™s blend mode to screen. Now we are going to do apple+t to free transform, then hold down shift and rotate it until the glow is in the opposite corner. Drop the opacity down to 25%. Now that we have a base to start working off of, we can start building our main piece. Click on the eye dropper in the tool bar and pick an orange-yellow color from the bottom left glow. 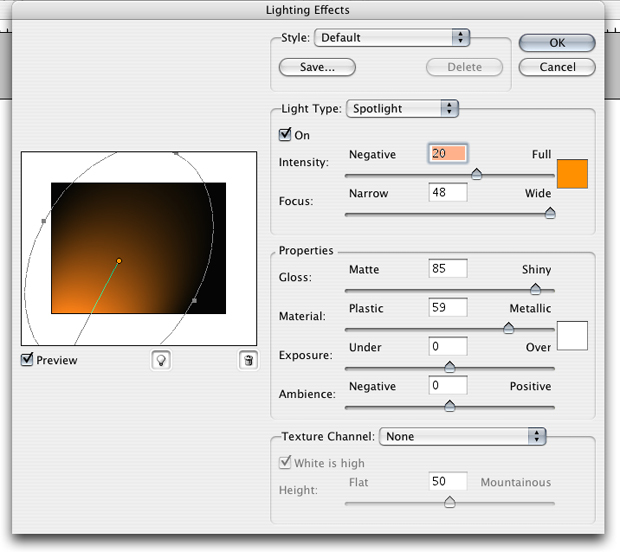 Now use the elipse tool to draw a circle. Change the fill of the circle to 0%, then go to your stroke in the layer styles. 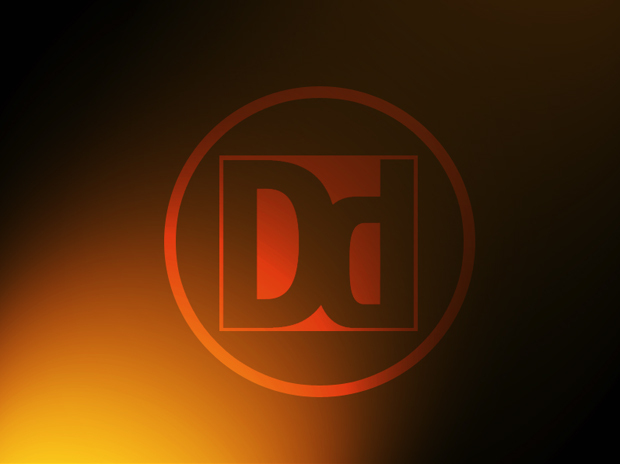 Change the size to 15px, make it an inside stroke and take the color you picked from the glow and change the stroke to that. Change your strokeâ€™s blend mode to overlay. Now we are going to ad some kind of text or logo to the middle. Whatever you are using, it needs to be one color. 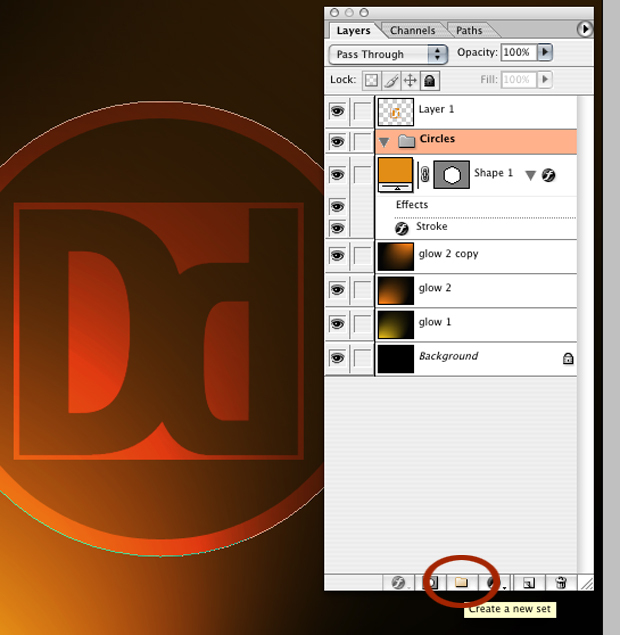 Change your text to the same orange we have been using and change the blend mode to overlay. Now we want to save the circle shape because we are going to be using it later on. So click on the circle layer and go to the path tab. Click on the circle with the arrow in it and choose save path. Call the path circle. Go back to the layers tab and create a new folder and call it circles. Create a new layer inside the circles folder. Now we are going to set up a brush to use on our circle. Click on your brush and press F5 to pull up the brush settings. 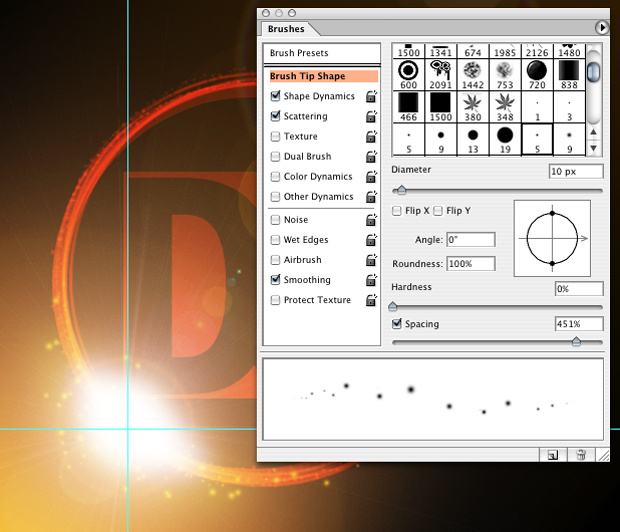 Set your brush diameter to around 5px. 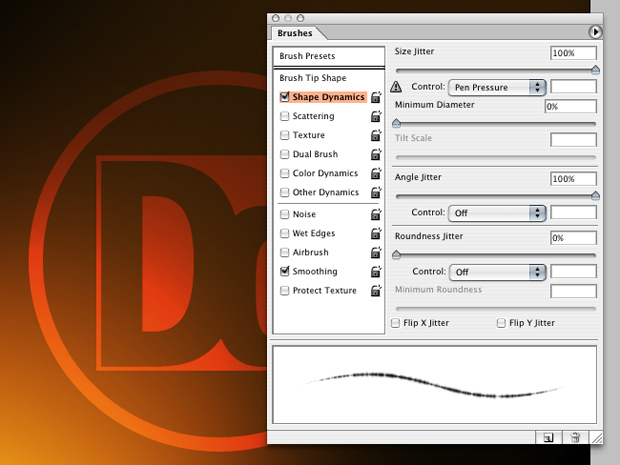 Change your spacing to 40% in your brush tip shape and your size jitter to 100% in the shape dynamics. Go back to your path tab and control click on the circle you saved. Go to stroke path and press ok. Change the blend mode to overlay and move it up and to the right. Repeat step 11 several times and adjust your brush settings frequently so you get something like this. Create a layer called bright light. Grab your brush, change the color to white, and paint something like this. 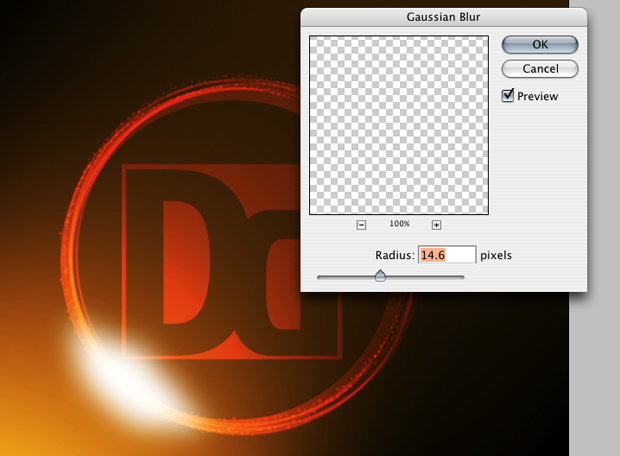 Go to filter>blur>Gaussian bur and set it up like below. Make a copy of the blur and enlarge it and add a soft light to it. Now lets add some lighting affects. 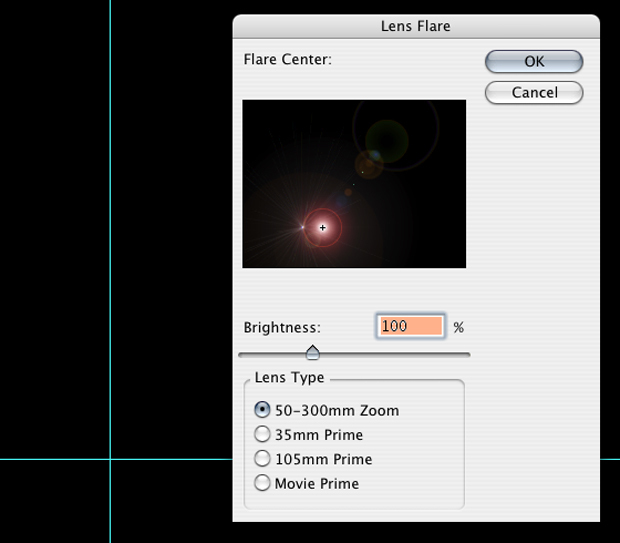 Create a new layer called lens flare 1. Now we are going to fill the new layer with black, but first we need to know where the flare is going so we are going to set up some guidelines to helps. 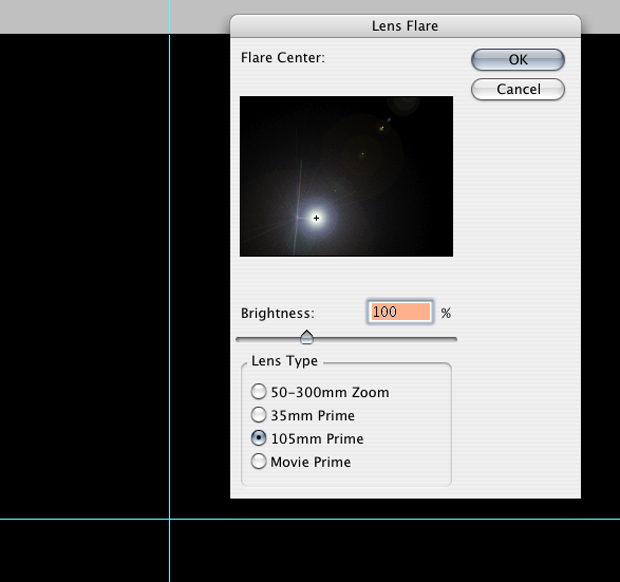 So now, fill the layer with black and go to filter>render>lens flair. Pick the 50-300mm zoom setting. Try to get the flair to go right where you set up the guidelines. Once you get the one you want change your blend mode to screen. We are now going to do the same thing as in step 16 but this time we are going to use the 105mm prime. I am going to give the bright area some sparks around it so go into your brush settings and create a spread out brush like this. You can change the levels to get a darker look. This is my final look. Sincere effort. Thank you for sharing your creativity. Best wishes. Simple, detailed tutorial. The steps are very easy to understand, this will be a great practice for beginners. Thanks for posting this! Hello.I am very curious about that.Where can I find additional post about it? Some recommendations? Normally I do not learn article on blogs, but I wish to say that this write-up very pressured me to try and do it! Your writing taste has been amazed me. Thank you, very nice post. I like the helpful info you provide in your articles. Iâ€™ll bookmark your weblog and check again here regularly. Iâ€™m quite sure Iâ€™ll learn a lot of new stuff right here! Good luck for the next!